Free Shipping Included! 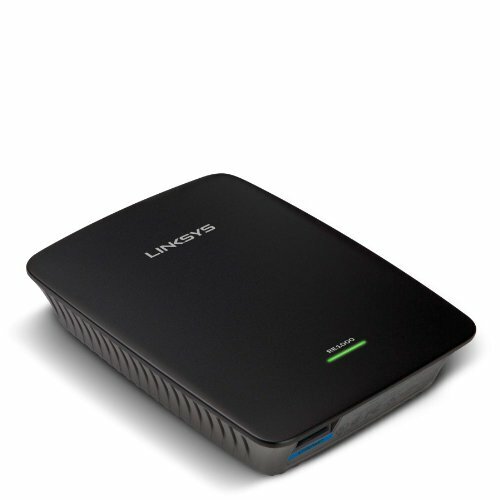 Linksys N300 Wireless Dual-Band Range Extender (RE1000) by Linksys at AABX. MPN: RE1000. Hurry! Limited time offer. Offer valid only while supplies last. Easily increase wireless network coverage throughout your home. Also works as a bridge to instantly connect wired devices to your network. Easily increase wireless network coverage throughout your home. Also works as a bridge to instantly connect wired devices to your network. Recommended for easily increasing the range of your current wireless router and network. The Linksys RE1000 works seamlessly with all b/g/n Wi-Fi devices so you can connect all of the computers and devices around your home. For best performance, pair with any Wireless-N router. Built with leading 802.11n wireless technology, the Linksys RE1000 provides reliable performance. Multiple MIMO (multiple input, multiple output) antennas extend your router's wireless coverage into hard-to-reach areas of your home. Wall outlet or desktop placement options allow you to optimize the location and position of your RE1000 to achieve best possible range and performance. QoS traffic prioritization technology is designed to deliver your time-sensitive Internet traffic efficiently so you can enjoy smooth video, music streaming, and gaming performance. Includes a built-in Fast Ethernet (10/100 Mbps) port, which works as a wireless bridge to instantly connect any wired Ethernet device to your network. The included setup wizard makes installation quick and easy. By recommending the best distance to place the range extender from your router you can achieve optimal coverage and performance. The Wi-Fi Protected Setup button is designed to make connecting devices to your range extender push-button simple and more secure.